Throughout India there are a number of beautiful beaches available in many states and union territories that are worth visiting. Now, many of these beaches in the country are ideal for outdoor activities such as swimming, sunbathing, or just for relaxing in presence of the “sun and sand”. However, there are a number of beaches that provide for some great water sport facilities. 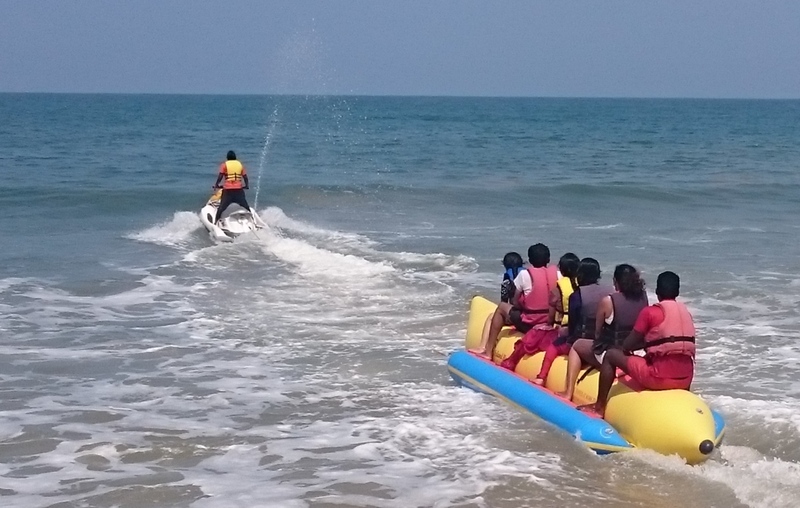 So, here is presenting a list of “8 Indian Beaches” popular for water sports. Considered to be “one of the most popular” in the state of Goa is a beach known as Baga. Located at a distance of about 9 km from Mapusa this pristine beach is known for its scenic beauty. Furthermore, it is also provides for water sport activities. They include windsurfing, parasailing, and kite surfing, and are extremely popular with tourists. In addition, this beach is also renowned for a great nightlife and good food. Considered to be “Asia’s best” by TIME magazine is the Radhanagar Beach located in the Andaman and Nicobar Islands. Situated on an island called “Havelock” this pristine beach is renowned for its beautiful white sand, crystal clear turquoise blue water, and tranquil atmosphere. Furthermore, it is popular for water sports activities such as snorkeling and scuba diving. As a matter of fact, this beach is said to possess some of the best diving centers in the country. “Queen of Beaches” is what Calangute a beach located in Goa is commonly referred to as. Situated in the northern part of the state this beach is considered to be the “largest” in this region. Furthermore, apart from its picturesque beauty this beach also provides for some splendid water sporting facilities. The sports available include water skiing, surfing, and parasailing. Comprising of an atmosphere filled with “tranquility” is a beach in Goa known as Cavelossim. Located in South Goa this beach is known for being pristine, and for providing magnificent views of the overlooking Arabian Sea. Furthermore, this beach is popular for providing with excellent water sporting activities such as speed boating, and diving. In addition, this beach is also a perfect spot for swimming. Located in the desolate spot in the Andaman and Nicobar Islands is the Elephant Beach. Furthermore, this beach is known for its “tranquil” atmosphere and “pristine” environment. In addition, to its picturesque beauty this beach is also renowned for “coral reef”. And hence water sporting activities such as snorkeling, scuba diving are extremely popular over here. Situated in close proximity to Baga and Calangute in Goa is an extremely scenic beach known as Candolim. This beach like many others in the state is known for its pristine atmosphere. Furthermore, this beach is also popular for many water sports activities such as skiing, banana rides, parasailing, water skiing, and wind surfing. Renowned for “tranquility and serenity” is a beach located in Goa known as Benaulim. Furthermore, this beach is known for its pristine environment, and serves as an ideal spot to relax under “sun and sand”. It is also renowned for water sporting activities such as jet skiing, snorkeling, parasailing, and windsurfing. In addition, services providing “dolphin spotting” is also available at this beach. Located in close proximity to Cavelossim in South Goa is a beautiful beach known as Mobor. Surrounded by beautiful coconut palms this beach is known for its clean white sand and clear blue sea water. Furthermore, apart from its picturesque beauty it is also known for its water sporting activities such as jet skiing, banana boat rides, and parasailing.